I enjoy waking up with the splendid sunlight in the morning. It sets a great energy to start a day. 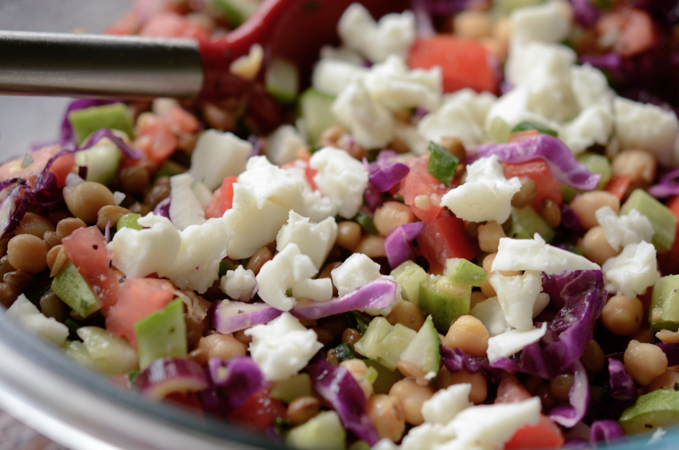 I always keep a few cans of beans and lentils, and I also happened to have some cucumbers, tomatoes, red cabbage, and goat cheese. How convenient! So here is my chickpea and lentil salad with various crunch vegetables and cheese. I think this is a perfect vegetarian salad if the cheese can be part of the vegetarian diet, and it is also gluten-free. 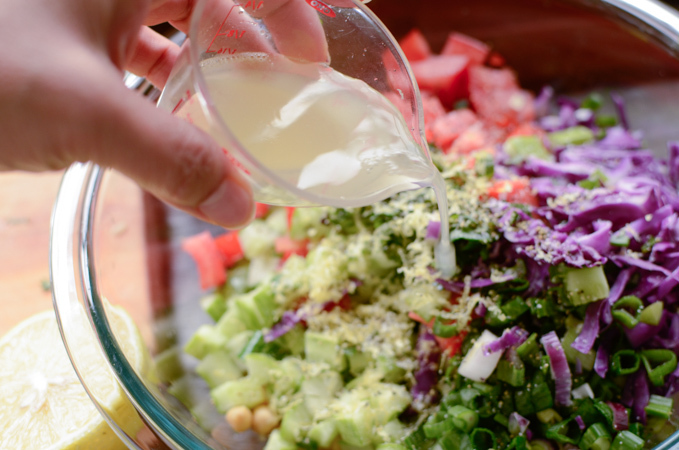 It is a super simple salad dressed with lemon and olive oil. I also have mint growing in my backyard, so I added a little bit. Oh, the fragrance! 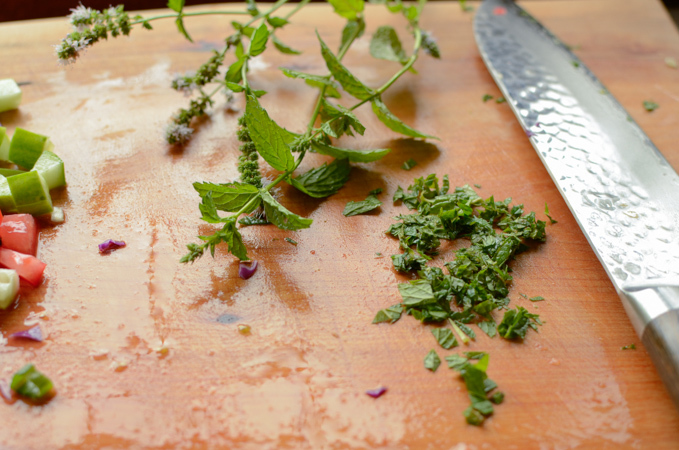 If you don’t have mint or you don’t like the fragrance of mint in your salad, you can substitute with fresh parsley. That would be equally tasty. 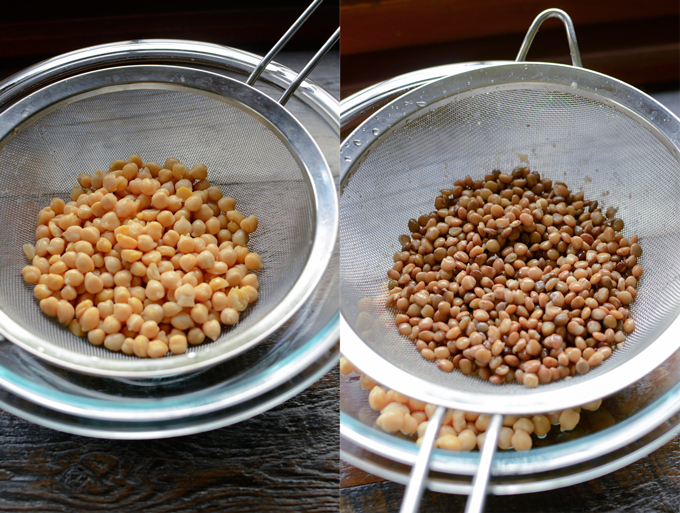 Rinse and drain your chickpeas and lentils. 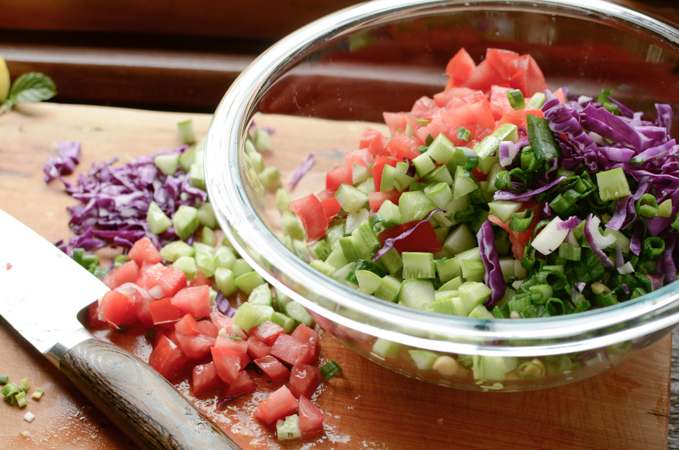 Combine with chopped tomatoes, cucumber, red cabbage, green onion. I like to remove the seeds from the cucumber and tomato. Add some fresh mint or Parsley. 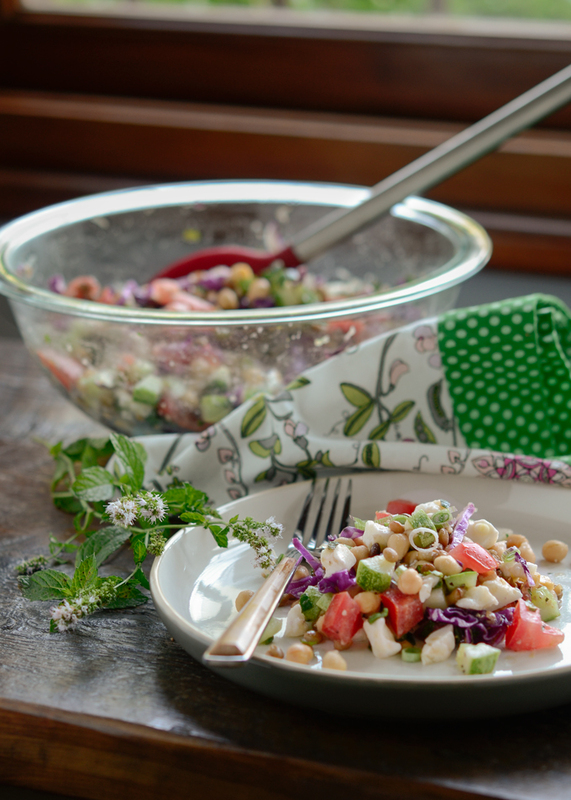 Too much mint can overpower the salad. About 1 tablespoon should be enough. You can add more amount if using parsley. Add some lemon zest, freshly squeezed lemon juice, and olive oil. Toss gently. I also added some goat cheese. Feta cheese would be good as well. 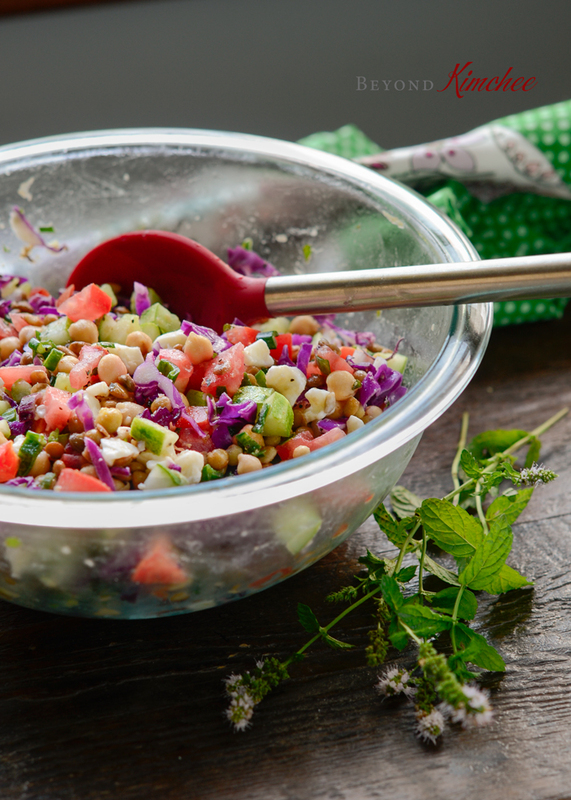 A bowl of colorful salad is ready! 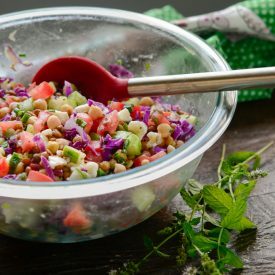 Chickpeas and lentils are quite filling and I love the fresh taste of lemon and mint combination. 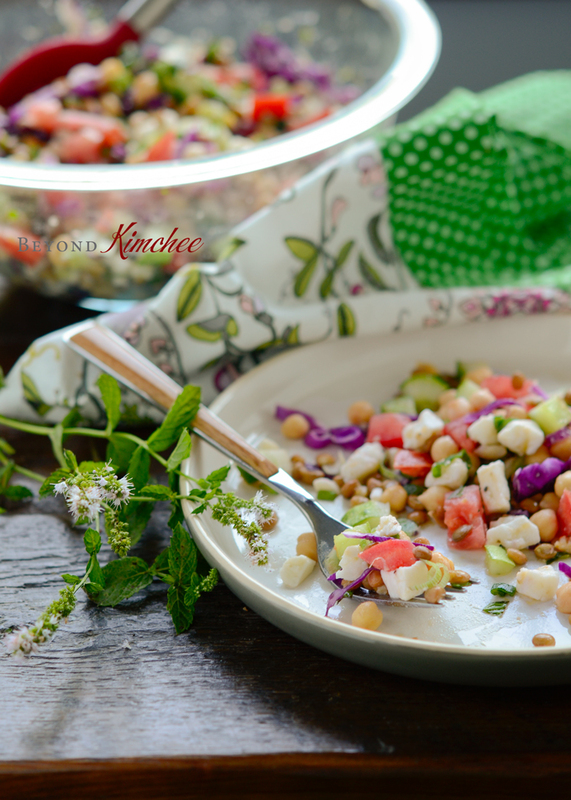 This is not only a perfect salad to eat as is for a simple meal, but will serve as a great side salad for a main course. I had a visitor last week, so I served this salad with dry rub grilled chicken breast as a dinner and it was a big hit. I realize that people do love chickpeas and lentils these days. That’s a cool thing! In a large mixing bowl combine all the ingredients and toss well. Serve immediately or chilled. However, do not chill more than 1 hour. If need to prepare in advance, combine all the ingredients except the lemon zest & juice, salt and pepper. Chill them in the fridge before ready to serve. Toss in lemon zest & juice and season with salt & pepper right before to serve. I love salads like this! So full of protein and goodness -- can't be beat. Thanks! I do, too. I like salad that are easy to make and nutritious. This fits the bill. What a lovely, fresh salad with healthy ingredients! Perfect lunch, too!